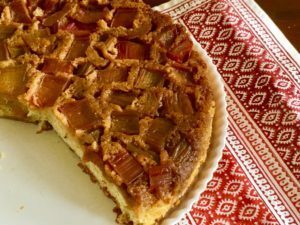 This easy upside-down cake recipe stars rhubarb in a moist, golden cake studded with sweetly caramelized fruit. 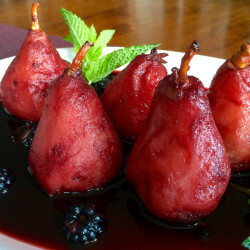 It makes a lovely spring dessert (or special-occasion-only, you-didn’t hear-it-from-me breakfast). Woohoo! 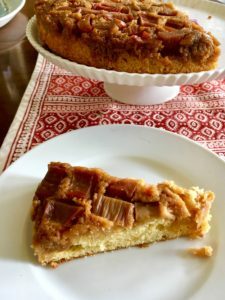 Rhubarb is in season! Grab your cake pan and let’s put it to good—nay, great—use in a scrumptious upside down cake, which gets kicked up a notch with the subtle scent of cardamom and a hint of orange zest in the cake and a bit of bourbon in the sweet caramelized topping. 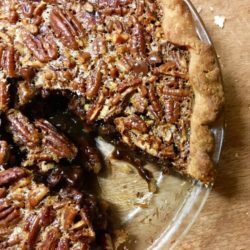 It’s super yummy and makes a terrific breakfast dessert! 1. Preheat oven to 350°F. Melt 6 tablespoons butter, brown sugar, and bourbon in a pan over low heat, stirring to blend into a sauce. 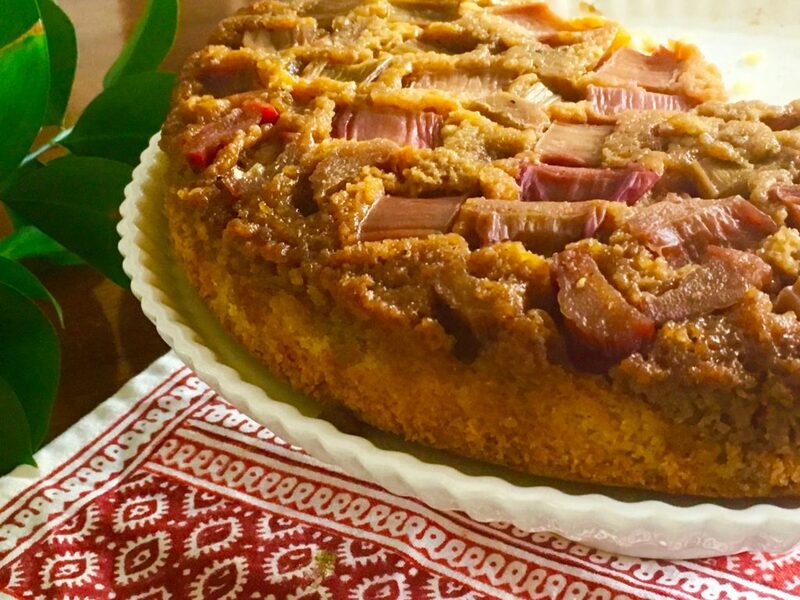 Pour sauce into a 10″ cake pan (ungreased) and place individual pieces of rhubarb atop. 2. Whisk flour, baking powder, cardamom, and salt in small bowl and set aside. In a large bowl, beat 6 tablespoons butter for about 30 seconds using an electric mixer, then beat in sugar until light Beat in both eggs until mixture is fluffy, then add vanilla extract, orange juice, and zest until combined. 3. Measure out milk, then add dry ingredients alternately with milk, mixing only until blended. 4. Spread the batter evenly over the rhubarb using a spatula until completely covered. Bake until cake is golden and a tester comes out clean, about 40 minutes. 5. After cake has rested and cooled on a rack for 30 minutes, run a knife carefully around the edge of the pan and turn cake directly onto a serving platter. Let cake rest an additional 5 minutes, then gently tap the pan with the handle of a knife a few times before slowly removing the pan. (It’s always gone fine for me, even when in a car—yeah, that happened—so don’t fret. 6. 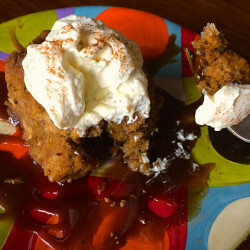 This cake is delectable all on its own and is also nice with a dollop of whipped cream. It’s particularly delightful warm, so serving it an hour out of the oven is perfect. Slices can be reheated in a microwave for about 10 seconds for later servings. Adapted from this recipe at beloved Bon Appétit. And did I mention that this cake freezes beautifully and serves a crowd? It’s a true seasonal favorite. Check it out!